The definition of the word "camping" means different things to different people. On our last camping trip to Disney's Fort Wilderness, we saw big campers with 50 inch televisions hooked up outside of them and kids gaming away on their Xboxes. My husband is a die hard outdoorsman and would never allow that on our camping trips. I think the only reason he even tolerates our annual Disney camping trip is that our kiddos love it so much and he loves to make them happy! To him, having electric hookups and air mattresses (which is my preferred way to camp:) is not roughing it enough. So this past weekend, he took us camping his favorite way-the primitive way. We packed up the car and hooked up the boat because where we were headed that is the only way to get there. Our destination was Shell Key Preserve, an undeveloped barrier island in Tierra Verde, Florida, which is about an hour and a half drive for us. Thankfully, my kiddos behaved in the car and before we knew it we were there. We unloaded the camping stuff from the car and loaded it into the boat (an extra step to do when your campground is only accessible by boat) and headed to the island, which was a 10 minute boat ride. We've been to the island before to play for the day and my husband and daughter have camped there before, so he knew where to go and there were no surprises. When we arrived, my little guy immediately got to work filling his buckets with water while we set up camp. 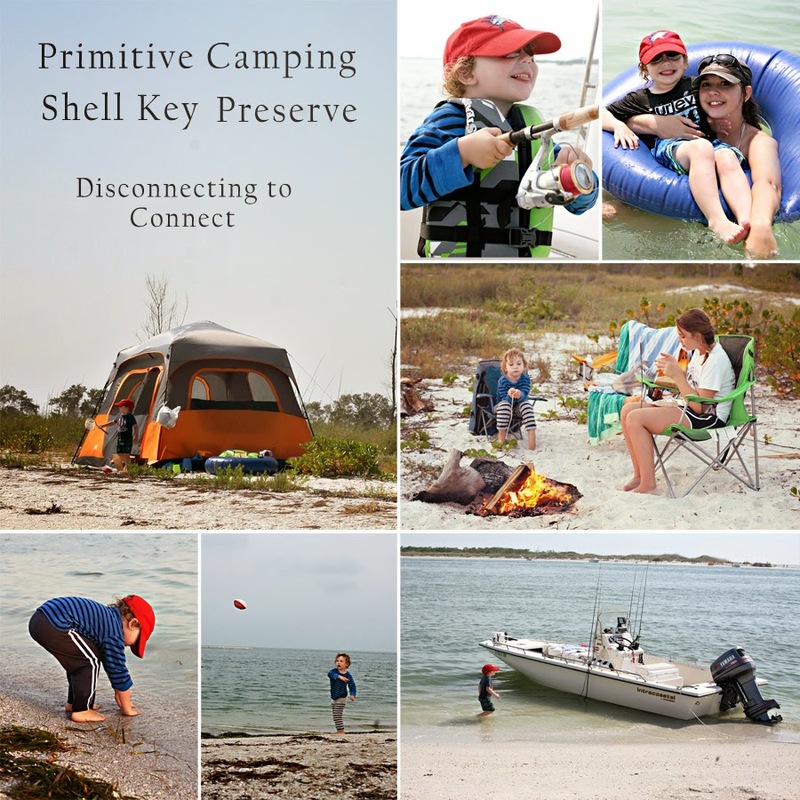 Now, if you're not sure what "primitive" camping is, it's camping with no electric, water, bathroom, etc. I mean, we were on an island with nothing except what we brought (which started to worry me a little when we started unpacking!) and no way to "plug in" to anything! We had charged our phones before we left and had them in case of emergency, but we planned on no electronics at all, just time to be together to connect as a family with no disruptions or distractions. You can't imagine how successful this was! 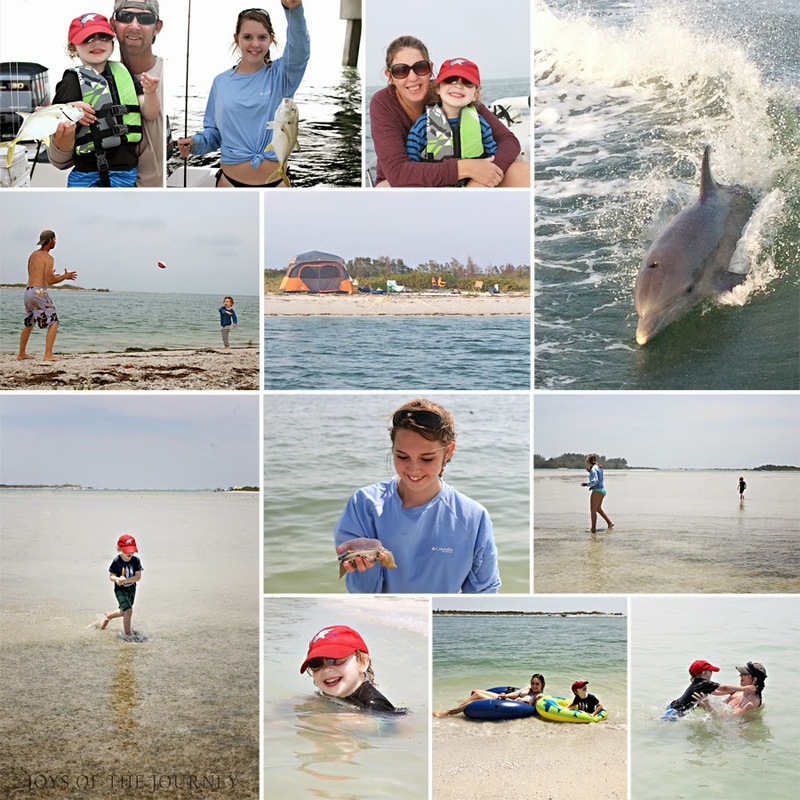 My kids enjoyed time together exploring the island, discovering marine life, fishing, and just plain having fun and since they are over ten years apart in age, this is no easy task to accomplish! The sea life on the island was a diverse variety. We saw hermit crabs, horseshoe crabs, live sand dollars, sea slugs and many different shorebirds. There were dolphins everywhere, swimming very close to the shore. The highlight of our trip had to be when two of them swam along behind our boat jumping, flipping and showing off for us! They were swimming so close to us that we could have leaned over the boat and touched them. I felt like we were getting our own private dolphin show. They truly are very playful and friendly animals! While snorkeling in the blue water, we found amberjack, snook, a tiny shark and a manatee. We took a hike around the island, admiring the view and marveled at the way the sun set over the mangrove trees casting an orange glow on the sea oats that swayed back and forth in the wind. We stopped to watch the crabs scurry through the black mangrove roots, which stick straight up out of the marshland like daggers. At night, we looked at the stars which were bright and plentiful in the sky because of the lack of light on the island. And we made s'mores because no camping trip is complete without them! This was one of our best camping trips yet! No one was distracted by computers, phones, ipads or t.v. We absolutely and completely were focused on each other and our beautiful environment the entire trip and we are all better off because of it. Who knew it was possible in this day and age to be completely electronic free for days at a time? I would completely recommend it and can't wait to do it again! I miss camping on the beach. Nothing like listening to the waves while sitting next to a fire. Camping in Florida, now even I could enjoy camping that way. Looks wonderful and having the boat too. Thank you for joining me for Country Kids. Thank you! It is a must do! Wow! What a fantastic family adventure! Thank you, Jill! It was a fun way to spend time with my family! Kerri, I am trying to get ahold of you to give you the info for the book swap with our website, The Educators' Spin On It. Can you please email me, your partner has mailed your book and activity to you and I'm sure you would like their info to send yours. THANK YOU! PS....what a fun weekend trip, I need to take our Family there soon.